The hen harrier, sometimes called the 'skydancer' because of its amazing acrobatic display in the breeding season, is one of England's rarest birds and is legally protected. Illegal killing of hen harriers has long been thought to limit their population size, but identifying the scale of these crimes and their impact on harrier populations has been difficult because they occur in remote areas and evidence is likely to be destroyed, thus successful prosecutions are rare. This long-term study has enabled patterns of disappearances to be assessed across a large number of birds. This provides overwhelming evidence that illegal killing is occurring on some grouse moors, where some gamekeepers view hen harriers as a threat to their grouse stocks. Stephen Murphy from Natural England led the data collection. He said: "Natural England welcomes the publication of this study, which demonstrates the value of tagging as a legitimate conservation tool. These analyses are a significant step in understanding the fate of tagged hen harriers, and confirm what has long been suspected – that illegal persecution is having a major impact on the conservation status of this bird." Professor Steve Redpath, Chair in Conservation Science at the University of Aberdeen, added: "The illegal killing of hen harriers on grouse moors has long been discussed, but is an issue that has proven challenging to quantify. Now, new technologies are allowing us to get better insights into what is going on. Our analysis points the finger at continued illegal killing on grouse moors across the north of England. These findings increase the pressure on grouse moor managers, conservation organisations and government agencies to find a solution that ends this illegal activity." 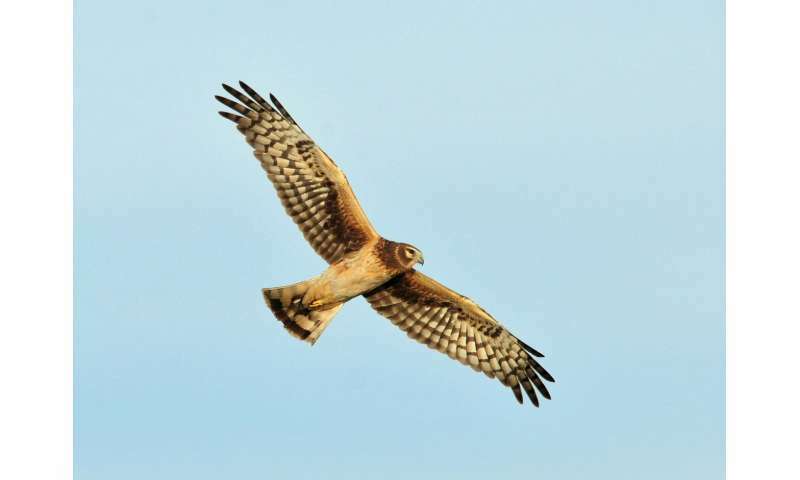 Natural England will continue its satellite tracking work to further improve understanding of hen harrier movements and behaviour, and continues to work with landowners and partners to change perceptions and find ways of enabling hen harrier populations to increase.